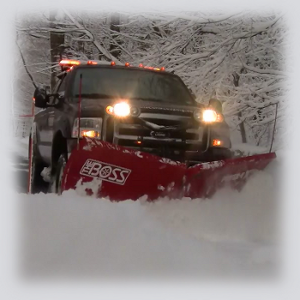 Here at Stateline Landscaping, LLC we’re one of the areas best snow & ice contractors for Ridgefield, CT. All of our snowplowing work is in Ridgefield, this means we’re never far away! Other contractors travel to many towns and are spread thin. We have several trucks on the road, each in one or two zones in town. This keeps our service times down and clients happy! We own all of our own equipment and have experienced operators. We provide service, not excuses! We use MagicSalt exclusively for clients who wish to have their driveways or walkways salted. This environmentally safe product is far superior sand or sand/salt mix. Clients love MagicSalt because there is no mess to clean up in the spring. There is far less mess in the house too! Most importantly their driveways are bare blacktop while others take hours, if not days to get down to clean blacktop. This product also works to -17F. Here in CT we hardly ever see temps below zero, but regular salt stops working at 17F ABOVE zero. When you need a safe passable driveway or walkway, you need MagicSalt!